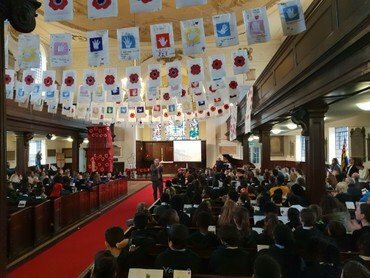 On 9 November 2018 we welcomed over 250 children, parents and supporters, from 5 different local primary schools, to St George's for a special event. To commemorate the 100th anniversary of the First World War armistice, St George's hosted a "Concert of Peace". Children came together to sing, read poems, and remember the cost of war and the importance of peace. 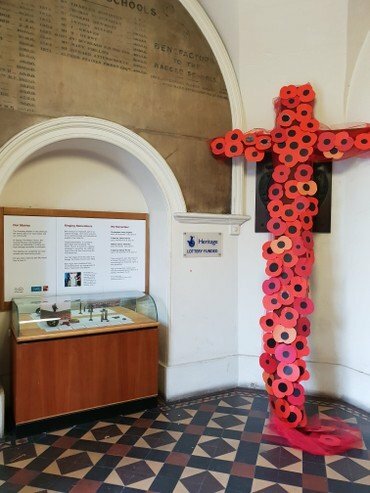 A group of staff and laity collaborated with Water City Music, professional musician Richard Brown, local schools, and Southwark Archives to bring the event together. Over the months leading up to 11th November, Richard Brown composed three original songs: "Ring Out the Bells for Peace", "Remember the Ones who didn't come back", and "Peace Song". Our Director of Music, Jonathan, taught these songs, alongside classic songs such as "It's a Long Way to Tipperary", to local school children. A member of the congregation, Laura, created complementary resources on the stories of local people during World War I to inspire these children to write World War I themed poems. Our Heritage Officer, Heidi, also held creative workshops with the children in the church to create 'peace banners' along with individual peace pledges. These were hung up in the church and acted as a central piece of decoration for the concert. These peace pledges epitomise the spirit of the concert as a whole. We wanted to educate children and parents about how peace was enacted in 1918 as well as how we can enact peace in our local communities now. It was a moving, thought-provoking experience which did justice to the significance of the anniversary. This built on our very successful Agincourt 600 concert of 2014, and we look forward to organising similar events in future. Our thanks to the St Olave's Foundation Fund and the Newcomen Colett Foundation for funding which helped support this event.